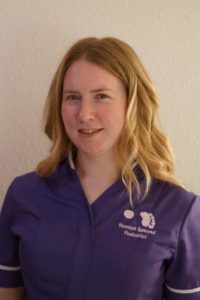 I am Hannah Lamond, a mobile Podiatrist that works throughout Suffolk and North Essex. I qualified as a podiatrist BSc (hons) 2:1 from the University of Salford back in 2010. For the past 9 years I’ve been a private sector Podiatrist, running my own mobile podiatry service for the past 5 years. When you book a treatment with me I will treat your feet in the comfort of your own home. Avoiding the stresses of driving, parking or having to leave the house. If you live in Suffolk or North Essex call or e-mail me to book your appointment. As a podiatrist I am trained to treat a comprehensive list of foot problems. This includes issues with the skin or nails, or with how the foot functions. Each year I further my skills in both routine and high risk foot care. The available treatments for foot problems are constantly evolving and improving. So I find it essential to keep up to date. Thanks to this ongoing training I am always best placed to inform you about your foot needs. I want to be the best expert I can be for your foot health. I wanted to become a Podiatrist to empower people to keep their feet as healthy as they possibly can. It is my belief that foot health is an essential component of overall well being and enjoyment of life. If you need extra help with your feet I keep good links with GP services and your local diabetic foot health team. Just in case your foot health ever reaches that need. I am fully insured and qualified to treat your feet. I am also registered with the HCPC – Health and Care Professionals Council. Those that know me will know I do a lot of swimming. In my free time I love nothing more than being in the pool and taking part in sponsored swims. I also help at a campsite owned by my other half and his Dad. This is certainly my second passion after feet. I am very fond of talking about being outside, and keeping active and healthy. Wonderful service from this charming friendly lady. My feet felt so much better after her first time visit today, that I had no hesitation in booking regular visits. Hannah knows all about the extra care required for people like myself with diabetes and COPD and has offered sound advice and support as well as first class treatment.